Ha Tinh (VNA) – Hung Nghiep Formosa Ha Tinh Steel Limited Company in the central province of Ha Tinh has completed 52 out of 53 environmental protection tasks required of it after violating regulations on environmental protection, according to the Ministry of Natural Resources and Environment (MoNRE). At a working session with local officials and representatives from Formosa on April 27, MoNRE Minister Tran Hong Ha agreed with the report from the ministry’s inspection delegation, and recognised the firm’s efforts to protect the environment. The report said the Taiwanese company completed and put 12 auxiliary items into operation, with seven others ready for commissioning. The company is building wastewater and overflowing rainwater treatment systems in waste dumps, and ore and coal storage areas. Automatic wastewater observation systems were installed in the biochemical and daily domestic wastewater treatment stations and in chimneys. Minister Ha stressed the need to evaluate technologies and projects to prevent environmental incidents from happening, adding that measures to reuse solid waste should be researched. He also asked for regulations related to response to environmental incidents and efforts to finetune the human resource and equipment capacity. The Minister asked ministries and sectors to assess Formosa’s environmental protection efforts and come to a unanimous conclusion, while local authorities must help the enterprise complete administrative procedures. Formosa was also requested to provide a plan to test its waste treatment facilities, and submit to ministries, lcoal agencies and sectors for assessment. 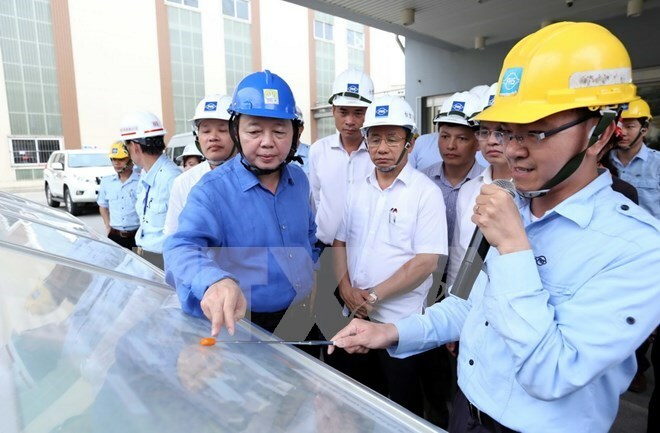 The same day, the Minister inspected wastewater treatment stations and the automatic wastewater observation systems in the biochemical and domestic wastewater treatment stations. The delegation also inspected the building of wastewater testing reservoirs, an important part of controlling waste and preventing incidents, which are expected to be put in to use from June 30. In July 2016, the Taiwanese company was found to have buried 100 tonnes of waste at a farm owned by the director of the Ky Anh Urban Environment Company in Ky Trinh ward of Ky Anh town. Earlier on June 30, it admitted responsibility for mass fish deaths in the four central coastal provinces of Ha Tinh, Quang Tri, Quang Binh and Thua-Thien Hue between April and May.